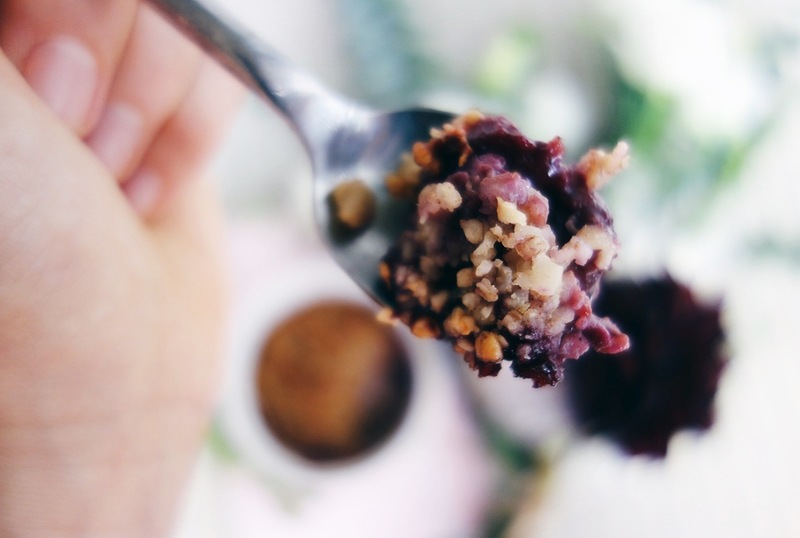 I Want Healthy Feijoa Berry Crumble For Breakfast! I love me some feijoas – a fruit I miss incredibility when I am away from New Zealand. They are so abundant this time of year that nearly everyone knows someone who has a tree full of them who is trying to give them away. In my head, it is illegal to pay for feijoas – why would you? The super markets charge anywhere from $8-$20kg which seems sacrilege. So I am taking full advantage of them during my time back in Auckland. Close enough! Apparently, originally they come from South-American. I’m going to choose to believe that I didn’t read that and pretend they are native to New Zealand :D.
Nutritionally, they have a lot to offer such as; a lot of soluble dietary fibre (6.4g per 100g, 7% of RDI) which is great for regular bowel flow; the antioxidant vitamin C (32.9mg per 100g, 55% RDI) – great for boosting your immune system going into Winter; small proportions of B-complex vitamins such as pantothenic acid, niacin, vitamin-B6, vitamin E and K, as well as minerals like calcium, magnesium, copper, and manganese. Mixed with berries, Ceres Organic’s virgin coconut oil, oats and almonds, this recipe is nutrient dense, has no refined sugar and is high in lovely omega-3s. Basically, you can eat it for breakfast or dessert – om nom! ***A note on the styling, these bah-utiful fleurs from Rose Tinted Flowers were sent to me by the lovely Arjun from Harpoon after making a recipe for Spiced Cashew Cold Brew for him. Lovey notebook is from the company Frank Stationery – you buy one, they give one to charity!